Toxic Perfection is a Character Asset – Ogle Watch Co.
Los Angeles watch maker Josh Ogle knows his strengths and his weaknesses. Depending on the day, pride can be considered either or both. Over the last 25 years Josh has started a company out of resentment, sold beach cruisers to gain humility, and shot commercial photography by chance. For most that would be enough, but as they say time waits for no man, and for Ogle Watch Company, that time is now. While studying to be a graphic designer in Boston, Josh ran across an article about custom bicycle frames in a magazine. Having the summer off he contacted the builder to see if he needed any seasonal help. He was willing to do whatever necessary to help out around his shop and hopefully get some money off the price of a new bike. “I called him up all excited,” tells Josh Ogle, president of Ogle Watch Co. “But instead of being thrilled at the idea, he was kind of a jerk about it. Telling me I was going to open up shop for myself and steal his ideas and that he would never show anyone anything. Being a professional frame builder was literally the farthest thing from my mind at that time. But I copped a resentment after that phone call and got to thinking.” Inspiration came later that year when Josh was in Oregon visiting his engineer uncle for Thanksgiving. “My uncle is a brilliant and amazing guy,” describes Josh. “For fun he rebuilds 17th century telescopes. He was working on this really complex orrery from at least a hundred years ago when I got there, just for fun. That week we built a bike stem in his workshop. I hadn’t made anything out of metal since like fifth grade, but I had a solid aptitude for it right away. I was hooked. So I moved to Oregon, struggled through building a few frames on my own, and then took a couple classes in titanium frame building and started a career making custom bikes. At that point I loved the process so much I had forgotten about that builder in Colorado.” As a graphic arts student he always had an eye for design, but little did he know his medium would come in metal. His designs evolved once he moved from Eugene to Northern California bay area and saw that you could add CNC capabilities to a Bridgeport mill. Josh is a self taught programmer. He took a basic turning class in Junior Collage and learned conversational on his retrofit Bridgeport mill. The rest of it he has just picked up and researched. “There is a big community of people out there that are willing to share their knowledge with you.,” explains Josh. “There are a lot of individual people out there that don’t have the resources of a big shop, but together we have a great collective of information. It has paid off wonderfully. I never forgot the rudeness of the bike manufacturer when I was younger. I don’t want to be that guy. I go on forums and share what I can with those willing to learn. So many people have done the same for me that paying it forward is rewarding. I look at it as we all get smarter together. If we share information everyone makes a better product be it a bike or a watch or a Mercedes supercharger, lol.” The Kitamura is equipped with a touch screen controller. The machine and the controller are filled with intuitive features. One that Josh cited as being incredibly useful is the thermal compensation. In a non air-conditioned shop this is especially helpful in the hot summers of So-Cal. Josh enrolled in a weeklong “beginning” watch making seminar in the mecca of time, Switzerland. He was the only one in the class without years of watch making experience. “They looked at me like some nutty mechanic who was arrogant enough to think he could build watches,” explains Josh. “The instructor didn’t even want to let me stay in the class. I convinced him to give me a shot and that if I didn’t keep up to kick me out. No harm, no foul. It was iffy at times whether or not he was going to let me stay. In the end he made a joke and presented me with my certificate of completion. It was at that point that I knew I had the confidence to become a watch maker.” Josh’s first watch attempts were admittedly not great. The design was lackluster and the producibility was way off what it needed to be. “There are things that look right and things that don’t,” details Josh. “The watch industry is interesting because there are watch designs that are outrageous and people love it because of that. Then there are traditional watches the people love because they are traditional. There is a weird dead zone in the middle and I was right there for a long time.” Not bold enough, and not traditional enough, Josh reevaluated his design and went bold with the help his CNC. Josh was drawn to the MYCENTER HX250iG for a number of reasons. His first priority was the 30,000-rpm spindle and the second was the size. “I love that they cram so much machine in such a small footprint,” touts Josh. 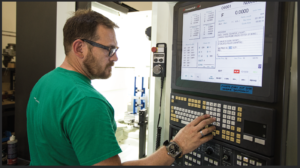 “It is a four axis mill with 50 tools and actually delivers what I need when it comes to surface finish. The rigidly, especially for its size is amazing.” Being able to push the really small tools in titanium is great for Josh. He uses a lot of 1/64th” cutters and notches tiny little pockets. He went to shrink fit tooling and run out is less than a micron. He tries to hold tolerances on the watch parts around half a tenth. Everything has to be accurate and stay accurate. 1. The starburst pattern on the bezel is a machined finish. Other manufacturers might try a similar finish by hand but by machining it Josh has the ability to go from edge to edge in a way others can’t. 2. Dial indexes cut with a .020” endmill. 3. A watch dial freshly back from anodizing. 4. The crown shares the starburts pattern of the case, but the logo is then polished for a striking contrast. 5. Josh offers different gear designs. Every gear is highly modified for looks and function. 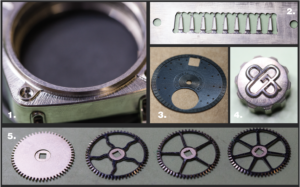 It is a painstaking effort to machine then hand polish all the gears in a watch. Since getting the machine he as become a huge fan of the pallet system. Everything is loaded at one time and he can spit out an entire case assembly in two starts. He explains how “Every case part I make lives on the pallets. Literally I load material and go.” Josh manufactures everything on the watch but the crystal, the second hand, and some smaller parts in the movement. 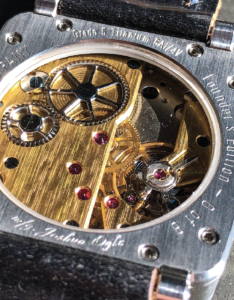 “A watch has a movement has four main plates,” details Josh. “I designed my own plates to replace the original generic versions. They’re 100% made in the USA on the Kitamura.” Josh had highly customized the movements he was using, but by watch purist standards it can’t be considered his own. “It is a pain staking process, but sets apart what I’m doing compared to others who use the same base.” Josh is of the philosophy why make a watch that looks like every other watch, acts like every other watch, but has your name on it? Two seconds with him and you know he wants to be different, dares even to stand out of the crowd. Ogle’s Watches appeal to the hard-core watch nerds who want a legitimate American made watch. Not an Apple Watch, not a fashion watch, but a hand crafted timepiece. “Little flashes of light catch your eye as you move the watch,” touts Josh. “Those details take hours and hours of time.” Polishing a single gear can take him 25-30 minutes. Horology is still an art form even when you automate some of the processes with CNC. Ogle’s Watches are large, and people notice them right away, but so many of the details are subtle and not immediately obvious. Josh loves that the more you look, the more you see, and the more apparent it becomes that someone loves what they do and really cared about producing an exquisite product. Josh only produced eight of the Founders Edition watches this year and has his sights set for 20 watches in 2018. Making a ton of watches is not in the cards. Low volume exclusivity is an aspect of Ogle’s Watches that aficionados crave. “Funny, this is the first interview I’ve done regarding my watches,” Josh says with a chuckle. 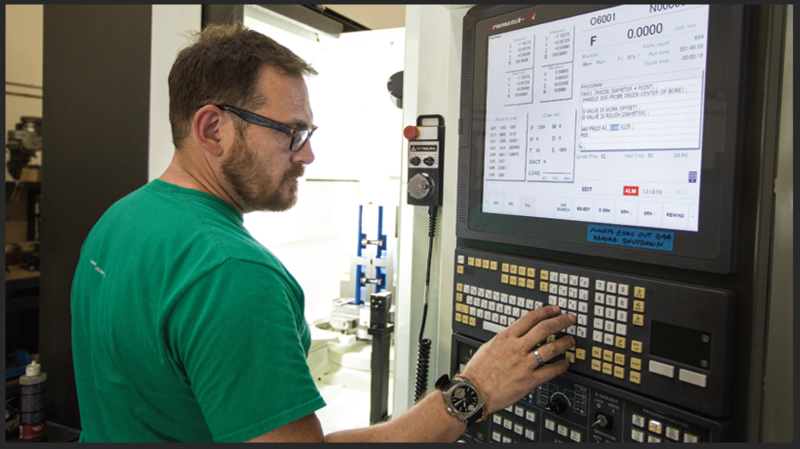 “I’ve been putting off talking with watch industry people because I’m not sure I’m where I want to be yet, but CNC West Magazine… That’s cool! I’m totally in for chatting about CNC and how much I love my Kitamura. I was really excited to have you guys come see what I do.” All the same attributes he strives for in his machining he sees in the Kitamura. “It is such a well made machine and the quality is evident,” concludes Josh “Aki Kitamura puts his name on every machine and he is proud of that. 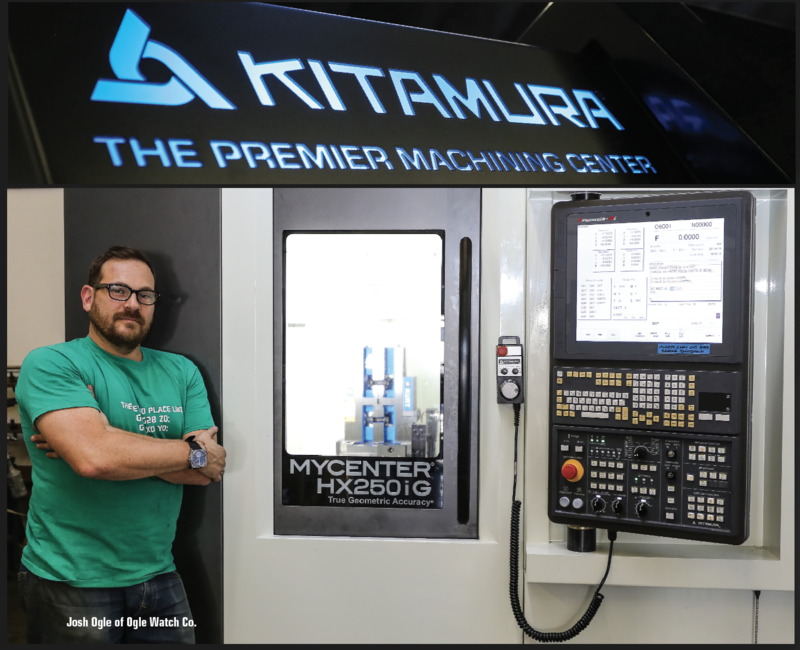 He recognizes his family’s legacy and it is reflected in the Kitamura machines.” As someone who is putting his name on a product too, Josh respects and appreciates that. Ogle Watch Co. might not be as well known as Kitamura, but they are well on the way.